Our new occupational therapist is fabulous. I get nervous when we get new therapists, but I have found that the each one brings unique viewpoints and offers great information for helping our son. One reason I enjoy our new one so much is that I feel that she works on a variety of things each session and she teaches me what to do at home. She works on sensory development, his core, signing, singing, helping him learn his different body parts and of course the use of his hands, just to name a few. He learns. He plays. It's a win-win. She wants Noah to be able to pick up objects, transfer them from hand to hand, bang them together, and take them out and put them in. That is all helping him learn to play. Granted these abilities do more for him then simply help him learn to play, but I think Noah will appreciate playing the most. 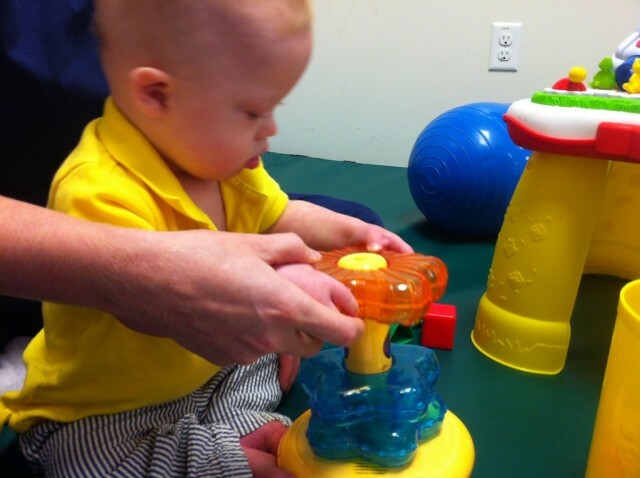 He's rocking the ring stacker at occupational therapy! Simply watching Noah realize that objects are inside the container and having fun getting them out is pretty awesome. He likes to get his face right up to the opening and look inside before he takes anything out. I often view the toys in our therapy sessions as motivators, but I realize that it is equally important for him to learn how to use all of these toys for pure entertainment. One of our goals in occupational therapy is for Noah to learn how to take off and put on the rings on a ring stacker…all in the name of playing appropriately with a toy. He will learn a few other valuable skills in the mean time, but the ultimate goal is play. Did you realize that play was an important thing to learn? How have you helped your child learn to play? Our therapist worked on just this very thing today. She is amazing and we love her. James works very hard and loves his therapy at the same time. Love this post! @facebook-1565348688:disqus Thanks! How old is James again? How often do you guys go to therapy? Noah is just sort of trying to figure it out, it’s so much fun. He actually just started reaching into the can of puffs to get food. I love watching him do it, you can feel the pride dripping out of him when he gets one out of the can. I whole heartedly agree that playing is something we have to work on with our kiddos (we have two older guys 4 and 7 and this never seemed to be an issue with them!) – something that really struck me with our little guy was he didn’t seem to understand “tickles” but his 7 year old brother kept going and going and now to hear the sheer joy from the two of them just mucking around is just wonderful – all good things come to those who wait!! What are some of their favorite toys? Are they in to iPad/ iPhone’s yet? It actually is Conor’s third birthday today!! Wow where did those three years go!! And for his birthday he is getting – skittles (pins) and ball, a pop-up pirate game (a great suggestion from another blogger! ), a toy iphone, russian dolls (OT suggestion not exactly boy toy but never mind! ), threading beads and spools and some other surprises from his relations. He loves the iPad however the downside is that he is climbing up on to the sofa and trying to change the channel on the TV using the swipe and cannot work out why is it not responding!! Thanks awesome!! Happy Birthday to him! What all do you guys have planned today? It sounds like he is scoring for his birthday! How fun. 🙂 I think I saw that pirate game on Ria and Bill’s blog…is that where you saw it? If so, that’s a great blog, and that game looked really neat. You’ll have to let me know how it went over. I have to just let you all know that Ria and Bill were spot on with the recommendation for Pop-Up Pirate. We got it last week for our kiddos third birthday (although the box recommends 4+ forget it our guys are way too advance to wait for another year!!) and it is amazing to see him sitting and working away figuring out how to get the swords into the barrel (which he does!!) – there are lots of other things to do with it beyond just the fine motor aspect – like put in the red (or blue or yellow etc) sword / top vs bottom (holes)/ turn taking – great suggestion! 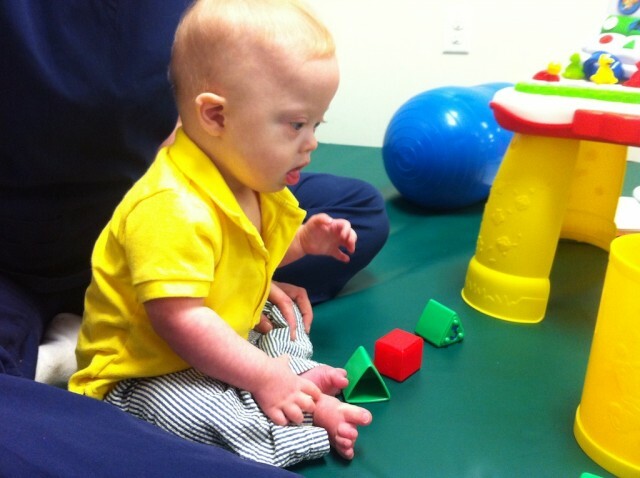 After watching Patrick and his therapists, it is amazing to me how many “toys” are used for therapy. It is truly amazing! His therapists making the work fun – we are very lucky. What are some of Patrick’s (or his therapists) favorite toys? Or ones that you’ve found helpful? This was a big issue with Riley and once she had her little a-ha moment, she’s been doing new things almost everyday. Once she got the hang of using her little hands, the toys became much more of a motivator. I once read that children with Down syndrome tend to not be as naturally curious and can be very content watching – especially faces. Hmmm, interesting. From my observations I see to see a mix, just like with ‘typical’ kids. Some kids that are outgoing, some that are more low key. It is worrisome to have to meet a new therapist again and again, but you seem to be very lucky with very passionate people. Noah is going to rock this world! He is doing so great! I am curious if your insurance is paying for all this or early intervention programs? In Florida we only get one therapy and then the other two we do through our insurance and that is limited. URGH! And it’s expensive. His therapy goes through our insurance. At first they said he only received ‘x’ amount of visits, so we put in a request with our insurance company to get more visits, and they approved them. We had to have our pediatrician and OT / PT to write a referral. We’ve found a lot of people aren’t aware that insurance will pay for private therapy. When you say you only get 1 therapy, does that mean ECI only comes 1 time a month, and that is for both his OT and his PT? That is a great idea! Thank you for the reply!!!! I will tell Scott. According to our insurance BCBS Federal Employee Program we get a total of 50 therapies for the entire year! That involves all therapies….so basically 50 and that’s it! Yet, we see the PT every week (and that is suppose to be through Early Steps Intervention) and OT and ST every other week. The GI recommended we get more from the ST since Enzo is having a problem with eating and weight gain. I look forward to sharing your information with Scott! He’ll really appreciate it! Hugs to Noah! So glad you are enjoying your OT! I was an OT before kids. It is a great profession even if it has a confusing name!. I hope our current OT never leaves 🙂 Did you work with kids or adults? I just found out my physio doesn’t use OT’s till Reubs is about 3! We have Linda, and she is a teacher (of what i have no idea) but Reubs has fun with her!! we get some alone time with Linda next week, so im going to ask her to explain exactly what she does! @b6491087702267aab5c9091a1f70360f:disqus You guys are rocking it! We don’t get OT but we do get PT and special ed. I have to say I am a early intervention special education teacher and I feel like I am always playing for purpose!! I always have a goal in mind -poor Cara!!! Thank goodness my husband is a big kid!! 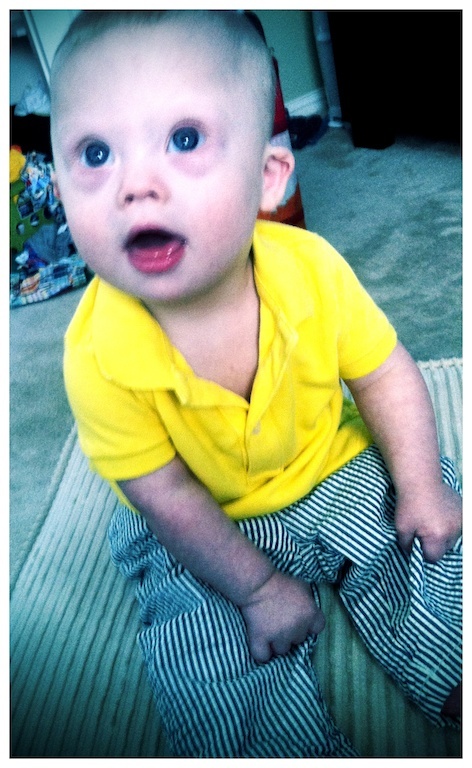 I am always working on gaze transfer, grabbing toys and shaking them! She is starting to play with the ring stacker – just batting it around and we are working on cause and effect. She pushes the top and it lights up.. I love learning to play it is so much fun!! Several years ago the twins were struggling with using discriptive language. They could write basic sentences but we wanted to get them to use more adjectives and adverbs. We figured if they started doing more imaginative play and had to tell us what they were imagining then they would start using this type of thinking when they wrote. So we got big sister involved, she is very creative. She would start a make believe game and then get the twins going with it. It really helped their language, their thinking skills and writing, and they had a blast. You don’t have to be a therapist really just think of what “typical” kids would be doing and find ways to imatate or approximate those skills in a game form. You mentioned getting new therapist, I so understand that one; but with us it’s new teachers. The girls have been in self contained special ed classrooms for their entire school life. In elementary school it was 1st- 3rd, then 4-6th, then we started middles school and they have special ed for most of their accademic subjects and are mainstreamed for electives and pe. So we have some the same teacher and others change….now on to high school next year..yikes! Thankfully they will have all accademics with the same teachers for 4 years, electives maybe fun (said somewhat sarcastically). But with all the changes it feels like each year I have to educate the new teachers and it takes forever…. @1c724cf5d0394afc1b9d4c73f7b963dc:disqus What sort of students do you work with? Thanks for commenting by the way. I can relate. We are so blessed to have early intervention for our Sunny. I remember the 1st time she learned depth and put something in a bowl was sooo exciting for all of us. I remember the first time her therapist told us we need to help her play it changed the way i did everything. She 18 mo now and is amazing all her docs! Ur lil man is too cute!